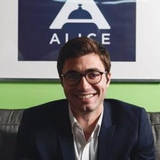 ALICE is a NYC based startup and the first end to end software solution for hospitality operations. Hotels use the ALICE platform to receive, manage, and execute any guest or internal staff requests across every department. ALICE also provides the hotels with a suite of mobile solutions for guest communications and staff mobility. The technology has helped hotels realize increased guest revenue and significantly improve efficiency through reduced service times. Mixpanel does all of our tracking for us. It's the basis of all of our data, and we supplement it with Google Analytics. We JUST signed a deal with Salesforce, so I can't say much about its service, but we looked at literally EVERYTHING: RelateIQ, Pipeline, Close.io, Insightly, Zoho. We were pretty close to going with PipelineDeals, but in our research we found that most of the services that had the same functions as Salesforce were approximately the same price. That wouldn't normally be a huge factor, but we were hiring a sales team and all of our potential hires already knew Salesforce. Going with Salesforce just reduced friction. We love Slack--there's no one on our team who doesn't. It's just fantastic. We actually don't pay for it yet because we still fit into their free plan. We don't concern ourselves with their data. It does what we need it to do, which is just managing our inbound email. We don't use any of its other features. We use Extensis now. When we were figuring out what to do, we spoke with a consultant and Extensis was the best fit for us. So far so good! It's a little more expensive, but it was justifiable for the service we've gotten, and it was very easy to set up. We love Jazz. It's just really easy to manage our pipeline. We'll set up a job, have people apply and then we can just sort through the profiles. But what's great is that you can sort through them in such detail. For example, we've created a database of people that we liked but just weren't a perfect fit, and now we have a whole grouping of candidates to reach out to when we have open jobs. Jazz does all that sorting and storage for us. CloserIQ is a great recruitment tool for our sales team as well. We’re big fans. We started with ZenPayroll, and I actually really loved it. It had a great interface and was easy to use, but we had to switch to something else from an HR standpoint, so we moved on to Extensis. Basecamp is really good on a project-by-project basis. Our dev team uses JIRA, and that is just ridiculously good for remote development. Some of our developers are in Moscow, and JIRA was by far the best at keeping everyone on the same page.